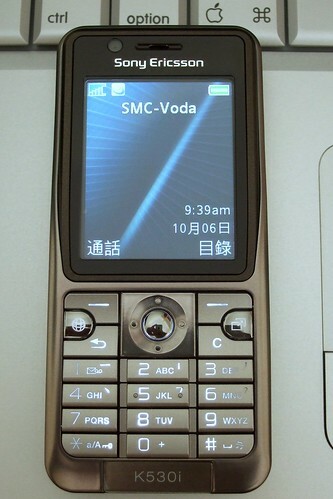 Sony Ericssion K530i, originally uploaded by hochit. Just being asked yesterday, I found a great solution without paying a cent. So lucky that someone has writen this plugin! Thx, PEACEYALL posted in macosxhints.com. I really hope someone else can do the same thing for me M600i also! Recently, I tried to use Quicktime to convert many of my video podcast video to my 3G phone. 5. In “Audio”, select “ACC-LC Music”. I tried speech before, the volume will be too low and hard to listen. I guess Symbian UIQ3.0 is too new. I couldn’t find many softwares support it yet. Same as OS X! I hope Apple will release iSync update soon to cater this need. I believe they’re working hard to let us sync Address Book and iCal just like former Sony Ericsson PDA mobile P900, P910 in future. I have been waiting for this Symbian PDA mobile long time until the version with Chinese support released in Hong Kong last week. Black box! Same color as the mobile. Charger, earphone & USB cord. Great! Come with 512M MemoryStick 2 that I don’t think I would spend extra to buy!